Bluetooth is not a new technology. The idea of making a small gadget connected via Bluetooth to our phone is not new. From camera remote, Bluetooth speaker to the simplest feature of all: a gadget to help us finding things. Thanks to Bluetooth connection, a gadget can trigger sound in our smartphones when we need to find our phone. We can also attach the gadget to anything we frequently lose, like key-chain, to find it when we need it. There are tons of products promising this feature in the market, yet only few of them does it right. Let’s start with a confession that I started very sceptical about Bluetooth tag products. Back in 2014, I got myself Bluetooth tag product called Gecko and it was one of the most disappointing technology product I have ever purchased. The connection was so unstable I couldn’t get myself to rely on it finding my lost item. Thanks to horrible experience with this Indiegogo project, I told myself that Bluetooth tag is not for me. That remains true, until I tried Tile Mate. Tile Mate is a third generation product. Already iterative improvement from its previous generations so I couldn’t tell much about its original version. As a Bluetooth tag, Tile Mate offers very simple design: white body with a grey button and a hole for keychains. The button is used to trigger its function to “call” our phone. It has built-in speaker to play some melody when we call it from our phone. Plain and simple, yet they do it right. First, battery. 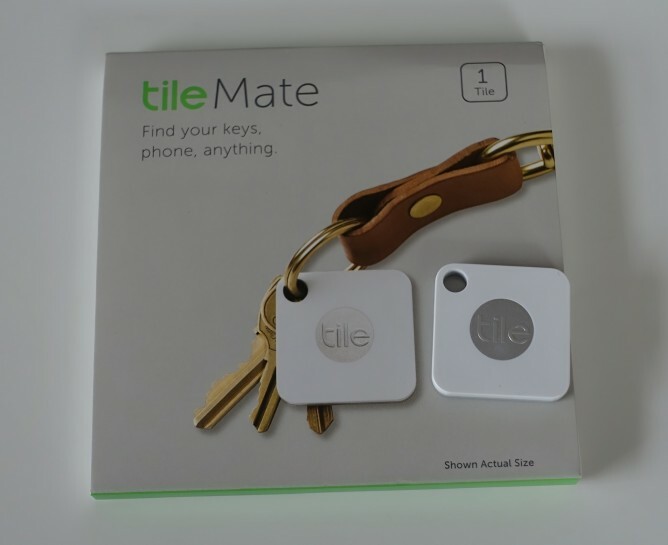 Tile Mate can only be activated once and it’s promised to survive at least one year after initial activation. The battery is not replaceable, so we would need to get a new one after the battery runs dry. Sounds bad? I agree. That’s what I initially thought, too. But then I realised. The technology available today is far from perfect. Removable/replaceable battery would drive the size of a product bigger than it should. There is no point of having a bulky tag that is not practical in most places. Rechargeable battery would not last more than 2-4 weeks. This product is supposed to help people to remember where they put things, not to add yet another thing to remember: charging them. When a tag could only lasts a few weeks, imagine a scenario when we need to find our lost things, we open our phones hoping to “call” our tag, only to realise that the tag is out of power. Bummer. Doing a product with non replaceable battery might sounds counter-intuitive in the first time, but when I re-think of it, it makes sense if such design choice allow a tag to be conveniently small and the battery lasts long enough to the point it does not become a burden. That’s exactly what Tile Mate has achieved. This Bluetooth tag is small, or to be exact 34mm x 34mm x 4.65mm. It weighs 6.1 gr, very lightweight to the point I don’t get noticeable extra bulk when I added it to my key-chains. Bluetooth connection is very stable. I have never experienced dropped connection. Not even once. At night I have a habit of putting my phone into flight mode. As soon as I turn off flight mode in the morning, Tile Mate reconnects without any action needed from me. Having tested this for few days, I am now confident I can always rely on it to find my keys. 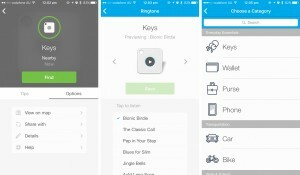 Setting up Tile Mate is as easy as following on screen guide from Tile app. After activating our Tile, we can choose to categorise it according to where we use it: keys, wallet, purse, phone, car, bike, backpack, ID badge, briefcase, luggage, passport, remote, tablet, laptop, camera, headphones, spare key, coat, umbrella or other. As a nice bonus, we can also choose the ringtone it will play when we call it. There are only 6 choices available (Bionic Birdie, The Classic Call, Pep in Your Step, Blues for Slim, Jingle Bells and Auld Lang Syne) but for me they are more than enough. The sound from Tile Mate’s built-in speaker is probably not loud enough if we put it inside our bag, but it’s loud enough for my case, using it as key-chain. When Tile is connected via Bluetooth to a phone, we can check its location on a map. Of course based on the GPS location of the phone. When our item is lost, we rely on its community-based tracker to find its location. This means, we activate “Notify When Found” feature and Tile will connect to any nearest Tile user within its range and we can track it. I was again a bit pessimistic with how big this community is, but it shows a range of 3400+ people nearby around my work place in Melbourne, Australia. Not a bad number at all. Not sure if that 3400+ number counts everyone in Melbourne, everyone in Australia or actually everyone within x kilometres from my location. An interesting aspect to note is that when we use Tile Mate to call our iPhone, it automatically sets the phone’s volume to maximum minus one. It makes sense because it will allow us to hear the sound. After the sound, it sets the volume back to its previous value. So we don’t need to remember setting back the volume when you are about to use an app with sound, such as games, that will make loud noise. Nice attention to detail. If there is one change I would like from Tile Mate, it is to make its back body also white. Currently, the back side is grey color and I think whole white body will make it look much better. Also, it would be super nice if reTile program could be made available in Australia. I think it’s fair for all Tile users to get their Tile replacement with lower price. Plus it would be nice to ensure all the old Tiles are being recycled properly. Disclaimer: I received free Tile Mate from Tile’s social media admin because of my comment in one of their Facebook posts. However, my review here is written objectively and not intended to be an advertisement.